The Metropolis is an exclusive new collection of residential towers, sky pools and parks, dining as well as a boutique hotel in the heart of downtown Los Angeles. 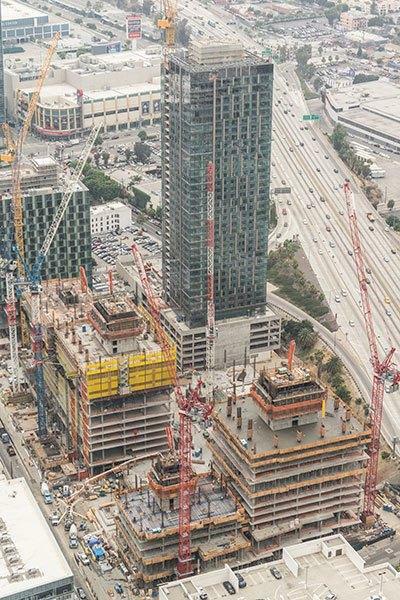 Positioned on 6.3 acres, the entire Metropolis site is part of a massive development of residential and commercial buildings around the Staples Center, which will have a great impact on the surrounding community. Overall an extremely tight space for loading/unloading equipment with no lay-down area. Doka provided complete Xclimb 60 Perimeter Protection Screens at 2.5 floors of cantilever, two Staxo stair towers - one suspended from the self-climber and another supported on a screen platform. On the high-rise core self-climber, 4,226 sq. ft. of Top 50 was used. Interior Core: The Super Climber SCP self-climber with 8 brackets using 6 cylinders to climb. Exterior utilized the SKE 50 plus exterior core self-climber with 20 cylinders. Additionally, 2,777 sq ft of additional Top 50 was required on the mid-rise core. Webcor used two separate hydraulic climbing systems to allow for larger rebar cages to be pre-tied and crane lifted into place. Perimeter Protection system which would still allow them to fly Truss tables. Instead of supplying a folding screen, Doka designed a full perimeter of Super Loading Platforms and over 34,000 sq ft of Truss tables. The Super Loading Platforms provided a loadable working platform for picking/storing equipment while still providing protection to the work area below. Tower R3 also has twin Super Climber and SKE 50 self-climbing formwork systems on the cores, one at the mid-rise and the other on the high-rise, with a combined 7,000 sq ft of Top 50. Thank you for your interest - two towers. Thank you very much for your interest - two towers.